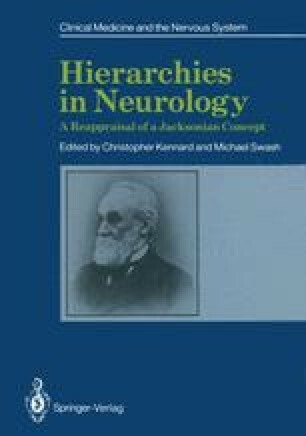 Although John Hughlings Jackson often referred to ocular motor control in relation to his general hypothesis of the hierarchical control of movement, he appears only to have written one paper specifically on the subject. It was written in 1909, and was entitled “On some abnormalities of ocular movements”. In this paper he recapitulated his concept of different representations of movements in centres at various levels of the nervous system, this time specifically applied to eye movements. The first level comprised a direct representation of eye movements in the ocular motor nuclei of the brain stem. A second, indirect representation or re-representation of ocular muscles as they are involved in more complex movements was encoded in centres of the middle level, which he interpreted as the motor region of the cerebral cortex. Finally, a third, “doubly indirect” and still more complex representation occurred at the highest level, the prefrontal lobe, containing, as he termed them, the “mental centres”. Thus he suggested a hierarchical control system in which motor impulses depart from the prefrontal lobe and reach the ocular motor periphery via the middle and lowest levels.